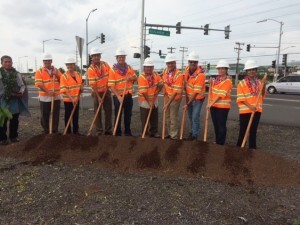 KONA – The Hawaii Department of Transportation (HDOT) launched the Queen Kaahumanu Highway Widening, Phase 2 project with a groundbreaking ceremony earlier today in Kona. 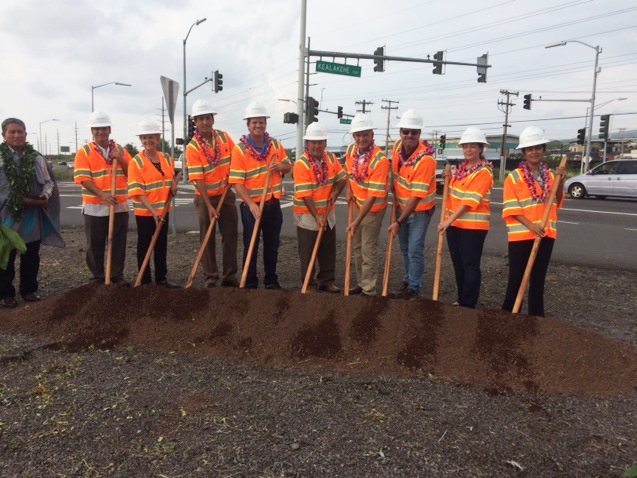 This project consists of the widening of the highway from a two-lane to four-lane highway from Kealakehe Parkway to Keahole Airport Road. Other improvements include the installation of new coordinated traffic signals and highway lighting at six intersections, landscaping improvements, utility relocation, drainage improvements, and pavement marking, sign, and guardrail installations. The State is also partnering with the Hawaii County Department of Water Supply and Department of Environmental Management to construct new water mains and facilities that will enable future sewer system expansion. The estimated construction cost is $90 million, 80-percent of which will be funded by the Federal Highway Administration. Work is anticipated to be complete by September of 2017, weather permitting. The community is invited to stay informed of the project’s latest developments by visiting the Queen Kaahumanu Highway website at www.buildqueenk.com, calling the project’s 24-hour hotline at 888-440-7988, attending community meetings, and being aware of changeable message boards along the highway. This project follows the Queen Kaahumanu Highway Widening, Phase 1 project that widened the highway from Henry Street to Kealakehe Parkway. Phase 1 was completed in February of 2007. Together, these projects will create an approximately seven-mile widened portion of highway with upgraded utilities along with bicycle and pedestrian safety improvements. A groundbreaking ceremony was held to celebrate the start of the Queen Kaahumanu Highway Widening, Phase 2 project. From left to right: Kahu Daniel ‘Kaniela’ Akaka Jr.; Ed Sniffen, HDOT Deputy Director of Highways; Cindy Evans, State House of Representatives; Dru Mamo Kanuha, Hawaii County Council Chair; Chad Goodfellow, Goodfellow Bros., Inc. President; Ford Fuchigami, HDOT Director; Steve Goodfellow, Goodfellow Bros., Inc. CEO; Ed Brown, Goodfellow Bros. Inc. Director of Operations; Nicole Lowen, State House of Representatives; Mayela Sosa, Federal Highways Administration Division Administrator.